Ameripack manufactures and sells a variety of plastic hard cases ideal for shipping and storage of sensitive equipment including military equipment and any other equipment or sensitive instruments including police, fire and rescue equipment and much more. 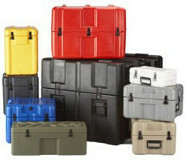 Ameripack manufactures and sells both Large Plastic Cases and Small Plastic Cases. Our plastic hard cases use a variety of manufacturing processes that guarantee the security of your equipment. In fact, the vast majority of our selection is hard plastic cases. Many of these cases meet ATA specs and are most often manufactured using thermoplastics and hard polymers. Hard plastic cases are manufactured using one of a variety of processes for creating molded thermoplastics. Blow molded hard plastics are manufactured through blowing plastic into a two-sided metal mold. This process can be used to create uniform mass produced hard cases. This gives you a seamless, uniform molding that is resistant to water, temperature and a variety of substances including most toxins and acids. Blow molding works best in the manufacture of hollow plastic objects. Learn more about our blow molded cases here or search our inventory of blow molded plastic hard cases here. Injection molded hard plastics are manufactured through the injection of plastic into a mold where it is formed into whatever shape required. Injection molding is a diverse process that can be used for small components to larger plastics like car panels and hard cases in a variety of sizes. Learn more about our injection molded cases here or search Ameripack’s inventory of injection molded plastic hard cases here. Roto molded hard plastics employ a hollow molding that is turned or rotated for the even distribution of the molded material (in this case, plastic). In this process, the mold is heated instead of the plastic, so the cooling process takes much longer but, among other advantages, less waste is produced. Learn more about rotational molded plastic cases here or search our inventory of roto molded plastic hard cases here. Thermoform molded hard plastics, often referred to as vacuum formed, are manufactured from a single sheet of plastic that is heated and pulled over a mold with a vacuum to create the case lid or case base. A matching metal valance is then bent to size and installed on both the case base and lid to allow the shells to interface with each other. Case hardware like latches, hinges, and sometimes handles can then be attached to this valance to give them strength and durability. Learn more about thermoformed plastic cases here or search our inventory of thermoformed plastic hard cases here. 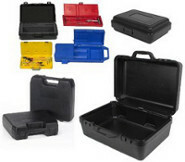 Whether you need a Big Plastic Case or a Little Plastic Case, Ameripack has you covered. Contact us for custom cases that meet your exact specifications.